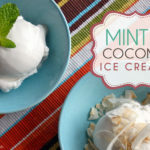 Today I’m actually going to share two different ice cream recipes – Coconut and Cool Mint. 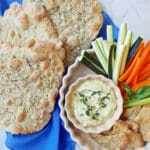 They are both sweetened with stevia, and also include a little vegetable glycerin to make them ‘scoopable’. Note that it’s easiest to make them with an ice cream maker at home. 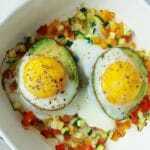 Switching to a healthier diet is often quite a challenging process, but you can make it easier by creating healthy versions of your favorite foods. Other examples might be making a zucchini noodle lasagna instead of your regular lasagna, or baking some delicious coconut bread instead of your regular bread. Once you get used to the changes and the new ingredients, you’ll quickly find a routine. And the improvements in your health will be enough motivation to stick with it! These ice cream recipes are just as good as the real thing. Try them and tell me which one you prefer! In a medium bowl, add coconut milk, vegetable glycerin, alcohol free mint flavoring, stevia and salt, whisk to combine. Pour coconut milk mixture into an ice cream maker, following the manufacturer’s instructions. Churn until the ice cream is just set, about 20 to 25 minutes. The ice cream will have a soft, creamy texture. If a firmer consistency is desired, transfer the ice cream to an airtight container and place in freezer for about 2 hours. Nutritious, tasty desserts like this are just perfect for the Candida diet. Looking for more ideas? Take a look at our Candida program. As well as lots of advice on beating Candida, it includes more than 100 tasty recipes for every meal and stage of the Candida diet. Thanks for all the recipes….please provide type of coconut milk used for this recipe as well as other. All aren’t created equal as you well know and want to have success with this. Hi Diana! I use Native Forest Organic Coconut Milk. Its one of the few brands that comes in a BPA-free can. I buy it online in packs of 12. What do you do if you don’t have an ice cream maker? Hi Kate, you can put it in your freezer and stir it every 30 minutes or so. It won’t have the same texture as if you use an ice-cream maker, but it will taste just as good! Check out Gingers Keto in the UK on YouTube and search for her Keto vegan Mexican chocolate ice cream. No charmer necessary. Just a freezer. ICE CREAM RECIPES!!!! How excited am I right now that one of my favorite desserts ‘Candida Style’ has been posted on this website. So happy- cause I am following Lisa’s entire program so I’m printing and adding to my Cookbook Binder ASAP!!! You make me happy as I follow your eating plan. You’ve made eating so tasty and so not boring. Thanks for all the hard work and TIME you have put into this. I will be FOREVER grateful. This looks great and I am excited to try it with my new ice cream maker. However, I have concerns about vegetable glycerin being okay for the strictest of Candida diets, such as in the first month of a program. Hi Kristen, everyone is different but I usually wouldn’t recommend vegetable glycerin for the initial phase of the diet. It can be used in small quantities later on though. Can coconut oil be used in replacement? Is alcohol free mint flavoring okay if you are in the first two weeks of the diet? I have read conflicting reports about this. I can only find vegetable glycerin in the beauty section at my local stores, it’s in stuff already. Where can you buy it or search for it that won’t go to the beauty section every time you search? DELICIOUS! I modified the recipe slightly, using coconut milk, COCONUT glycerine, powdered stevia and salt, omitting the mint element and adding cinnamon and crush walnuts! It was DIVINE! Even my husband loved it. Thank you so much. 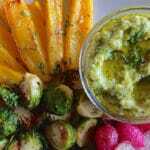 Hi Lisa – I am really enjoying the recipes but have one question. Some recipes say to use canned coconut milk and some don’t. Is it safe to assume that if the recipe doesn’t specifically say “canned”, I should use it anyway? Is there ever a time I can use the refrigerated coconut milk?